RNA-Seq is the most comprehensive high-throughput sequencing-based approach for the qualitative and quantitative analysis of entire transcriptomes of model and non-model organisms. Fragmented cDNA is sequenced, the resulting sequences (“reads”) are mapped and compared to known genomes or transcriptomes. For non-model organisms, the reads are assembled and annotated for example to protein databases or other transcriptomes. Quantification of the RNAs or contigs is achieved by counting the corresponding fragments after annotation to a known genome or transcriptome or after de novo assembly and annotation to the Swissprot /TREMBL protein-database. As full-length transcripts can be analyzed, the technique detects splicing-variants, SNPs and indels, transcription start sites and alternative poly-adenylation. Data quality is strongly depending on vigilant sample preparation, sequencing depth and -length. Datasets are immense and the analysis requires powerful computers and fastidious bioinformatics. Please click for information about our smallRNA-Seq service or Kit or MACE-Seq service or Kit. 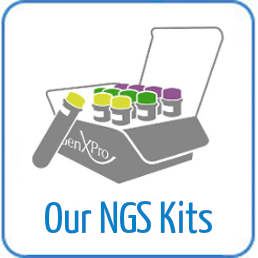 At GenXPro we have developed sophisticated sample preparation protocols, avoiding biases such as through GC- or AT- rich regions, low 5′ end- representation or inflated 3′ end representation. Besides efficient RNAseq-standard analysis of model organisms, we have successfully de-novo assembled numerous transcriptomes of non-model organisms and developed optimized bioinformatics for best results. For sequencing RNA from blood-derived samples we include depletion of the highly frequent globin transcripts, which represent 80-90 % of all transcripts. In a regular RNA-Seq experiment, the quality of the data is often thought to be related to the numbers of sequenced reads. However, during PCR steps of the sample preparation procedure, the original template molecules are amplified. While only the template molecules carry the information, the PCR products are simply copies of them and in theory only one copy would be sufficient, while all others do not contribute to the information content of the sample. It is therefore pivotal to identify these “PCR copies” and eliminate them, as they can introduce a bias into the data. At the same time, only those “copies” can be kept that have the best read quality, which will strongly improve the data quality in general. The best currency for RNA-Seq quality is therefore the number of unique reads in the sample, not the number of reads. With TrueQuant, we can eliminate PCR copies and therefore strongly improve the results. Data provided via sftp. Data can be provided in all standard formats of choice. Our bioinformatics service is also available for external data: Simply ask us for a quote if you need high-quality analyses of your NGS data.